Some people think that having a flashlight that they can carry can be a hassle because it’s too big or bulky. Fortunately, with today’s technology, manufacturers have the power to create small pocket flashlights that are not bulky nor heavy for you and your bag. Small pocket flashlights are essential for different reasons, and we will all find out more about it later. When choosing a small pocket flashlight, it can be daunting to pick which one because there are a lot of pocket flashlights on the market today. Some manufacturers may say that theirs is an excellent catch because of the excellent benefits, while there will also ones who will claim that theirs is better. That is why, to make things easier for you, I’ve rounded up the top 10 best small pocket flashlights today to help narrow down your options when it comes to purchasing a small pocket flashlight. The J5 Tactical V1-Pro 300 Lumen Ultra Bright Flashlight is known to be super bright wherein its light can reach 600 feet due to its intense light beam. It is equipped with different kinds of light modes, including strobe, intelligent, high, and low. With all of these modes, you will surely be able to be ready no matter what the circumstances there are. One of the best things about this flashlight is that you can use the strobe mode to protect yourself by disorienting a potential attacker. Additionally. 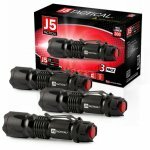 The J5 tactical flashlight can be operated using a 14500 rechargeable battery. You can also use a triple-A standard battery if you prefer that. Just make sure that you have spare batteries when you go out for quite some time is you won’t run out of batteries. The Hausbell 7W Ultra Bright Mini Led flashlight is a pocket flashlight. It has a 7W LED flashlight with a zoom light lamp and a torch focus that’s adjustable. This flashlight is equipped with a maximum of 300 lumens to ensure that it will provide an optimal brightness. Despite its small size, this flashlight has a blinding effect because of its brightness. Also, it is waterproof and skid-proof, so you don’t have to worry about anything at all. 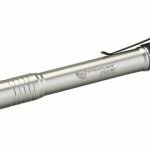 The Streamlight 6618 Stylus Pro LED Pen Light is equipped with a C4 LED, which can provide 90 lumens and a beam of up to 58 meters. 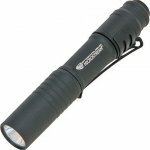 This pocket flashlight can operate for 6.5 hours, and it’s very compact wherein it is similar to the size of your market. The flashlight includes two triple-A alkaline batteries. A lot of people love this pocket flashlight because it is corrosion resistant, abrasion resistant, scratch resistant, water resistant, and as well as impact resistant. The reason behind this is because this flashlight is made out of polycarbonate material to ensure that it’s scratch resistant and unbreakable. The J5 Hyper V Tactical Flashlight has a maximum output of 400 lumens, which means that it can produce extreme brightness. It has a LED bulb that can produce a bright beam an intense light that can reach a maximum of 800 feet. One of the best things about J5 Hyper V is that it included four different lighting level modes, including strobe, intelligent, high, and low. These modes will help you to be ready no matter what situation comes your way. The strobe, on the other hand, can help protect you against attackers by disorienting them. Lastly, this tactical flashlight needs three triple A batteries that should be purchased separately. The Mini Perman 1000 Lumen CREE XPE-R3 LED flashlight is made out of aircraft aluminum, which is abrasion resistance, skid-proof, and very much durable. It is also very compact in size and has a clip, which you can attach to almost anything, including your belt. This pocket flashlight is equipped with 1000 Lumens and is powered by a triple-A battery, which isn’t included. Lastly, this flashlight has a one switch mode, and it is also capable of standing on a flat surface. The Glaree E03 Keychain Flashlight has a 2-way clip, which can be used as a keychain. The keychain can help you attach the flashlight to your hat, bag, belt, and pocket. You can also attach it to other things as well or even places. It is one of the most portable penlights on the market today. This flashlight is powered by 150 lumens and a beam distance of 45 meters. It also requires triple A batteries. Lastly, this keychain flashlight comes with black, blue, purple, and red. 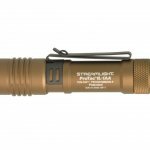 The Streamlight 88061 ProTac 1-L1AA Dual Fuel Ultra-Compact Flashlight is one of the small pocket flashlights today. It is equipped with CR123A Lithium Battery and can run for 1 and 50 minutes at 350 lumens. You can also use double-A alkaline or double A lithium batteries. If you are going to use double-A alkaline batteries, then it can last for an hour and 30 minutes when you run your flashlight on 150 lumens. For double-A lithium batteries, it can last for four hours and 25 minutes. 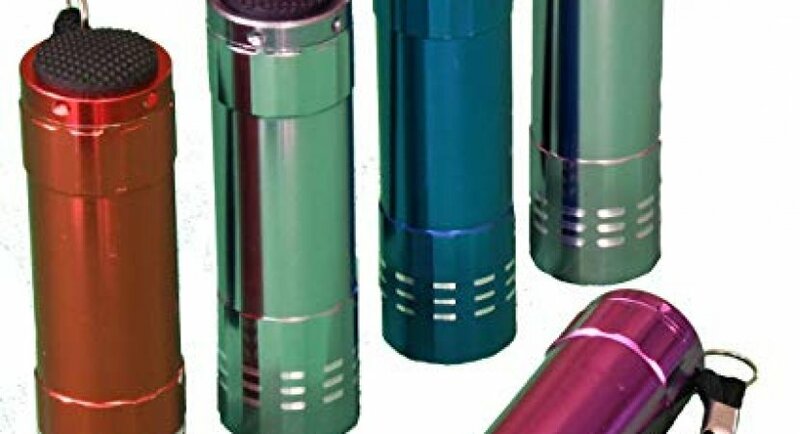 Lastly, this pocket flashlight is made out of aluminum anodized construction, which makes this very durable. The Streamlight 66121 Stylus Pro Pen Light has a silver holster and a white LED. It comes with black, silver, blue, and red, which makes it stylish for everyone. This flashlight is made out of aircraft grade aluminum alloy and an anodize plating. Also, it has a lens that is made out of unbreakable polycarbonate. This means that the flashlight is corrosion and water resistant, while the lens is unbreakable because it is made out of polycarbonate. One of the best things about this pen light is that it has a 30,000 hour lifetime due to its C4 LED technology. Lastly, to make sure that this operates, out includes two triple-A alkaline batteries. 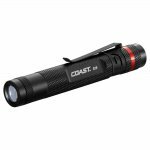 The Coast G19 LED Inspection Flashlight is known to be ultra compact and is equipped with a total of 54 lumens. This just means that this flashlight can comfortably fit in your pocket and carry it around. The clip will help you attach this pocket flashlight anywhere you, please. It also has a total beam distance of 65 feet or 20 meters. One of the best things about this pocket flashlight is that it is impact and water resistant, which means that you can use it anywhere you are. Your small pocket flashlight should be small in size since you need to make sure that it under six inches in length. The best size and shape of a small pocket flashlight is one that has a tube design, which is not only easy to carry but is also comfortable. A small to medium size pocket flashlight would be best. The most common type of batteries used is 18350, 16340, and 18650 which are all rechargeable. The performance of the flashlight will usually rely on the type of battery that is being used. 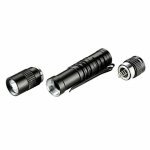 There are also some flashlights that are using CR123A, which is easy to find and is usually better than the ones mentioned above. The best thing that you can do is to find a flashlight that has the ability to use different kinds of batteries for extra versatility. The runtime will depend on the way you’re using your pocket flashlight. A pocket flashlight may have 1 lumen or even less, but there are also some that have 60 lumens or more. Typically, a 1-lumen pocket flashlight is perfect for reading a book or anything that can be used for closeup work. The runtime will also depend on how much you’re using the pocket flashlight and the kind of battery you’re using. The flashlight has different features that you should know about, especially if you don’t often purchase a flashlight. 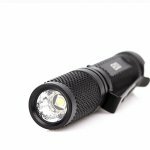 When buying a small pocket flashlight, you need to start looking for one that has all the essential features of a good flashlight. These features should be added to the things that you should consider when purchasing a small pocket flashlight. Continue reading below so you can familiarize yourself on these features. There are three kinds of batteries that you should choose, and it is essential that you are familiar with each one of them. Rechargeable ones are initially pricey, but since they can be recharged, this means that you no longer have to purchase another one for quite a long period of time. The best thing about using a rechargeable flashlight is that it has excellent performance and a long running time. You can either choose from lithium-ion or Li-ion for the rechargeable batteries. Some of the most common kinds are the RCR123A and the 18650. The disposable lithium battery has the ability to last for an extended period of time, but they are known to be more expensive. When it comes to lithium batteries that are disposable, the most popular is the CR123A. This type of battery is seen in tactical lights because of its size and power. The disposable alkaline battery is commonly known as the D, C, AAA, and AA batteries that are available in all grocery stores. They may lack power unlike the disposable lithium battery, but they are affordable and are very easy to find. The water resistance of the flashlight should also be taken seriously. This will help you make sure that you will be able to use it no matter what the weather is. There are three categories of IP rating system. The IPX 4 rating will only make your pocket flashlight splash proof, while the IPX 7 rating will help your flashlight be resistant and waterproof for 30 seconds and be submerged for up to a meter. Lastly, the IPX 8 which is the highest category will let you submerged your flashlight for a total of 4 hours. The impact resistance is typically measured in meters and how your pocket flashlight can deal with drops to a concrete surface from a certain height. Testers are the ones doing the testing, and they rate the impact resistance of the pocket flashlight depending on the damage occurred if there are any. There are some pocket flashlights that have multiple switches, and they have their own purpose. The switch types are usually located on the head or tail, body, and on the tail cap. The body switches can work to help turn off and on the flashlights or cycle through the different modes. Another type of switch would be the twisting or rotating of switches. The reason behind this is because the flashlight won’t accidentally switch on whenever it is stored inside your pocket or your bag. The only problem with this kind of switch is that you need to use two hands so you can rotate it. Small pocket flashlights also offer multiple light modes, which are the high medium and low. There are also some flashlights that offer beacon, strobe, and as well as SOS. The beacon and SOS are perfect during emergency situations. The strobe, on the other hand, will deliver a bright, fast blinking light which is perfect for self-defense. As you all know, the flashlight needs to be durable and has the ability to withstand any conditions. The best thing that you can do is to choose a flashlight that is made out of high-quality materials. A flashlight that is made out of weapon-grade aluminum or top quality military grade would be best. The run time, on the other hand, is being measured by hours. There are some pocket flashlights that have the ability to run for a hundred hours when using a low output mode. The best light to choose is something that can produce a maximum of 1,000 lumens. When it comes to the beam distance, it will then be measured in meters. The measurement will start from the flashlight to space or the object that you are trying to illuminate. This kind of measurement is known as a flood or the throw of the flashlight. The brightness of the flashlight will depend on the lumen. Majority of the pocket flashlights today are using LED bulbs. The reason behind this is because they are more efficient and brighter compared to the incandescent bulbs. Flashlights can have a minimum of 20 lumens and a maximum of 2000 lumens or even more. One of the reasons why you should bring a small pocket flashlight is to help save the battery on your phone. Today, most people are using their smartphone’s flashlight. This can take a toll on the battery of your phone, and you won’t be able to use it during emergencies. So it is better to bring an actual flashlight with you. A flashlight will help you during an emergency, including during power knockouts. It is also essential during rescue and survival situations especially if your phone’s signal is not working. As mentioned above there are flashlights that have unique features, including beacon and SOS, which are both perfect for emergency situations. Carrying a flashlight will help you to use it for self-defense purposes. There are pocket flashlights that can help blind the attacker temporarily. Choose a flashlight that has a minimum of 60 to a maximum lumen of 100, as these lumens can help blind your attacker for a few minutes. This is enough for you to run away from the attacker. You can also use the strobe mode to help disorient your attacker. The strobe will emit a rapid light which will disorient your attacker immediately. Of course, the flashlight can help you see what’s ahead of you especially if you’re running at night. The flashlight can help spot whatever’s ahead of you even if it’s dark. 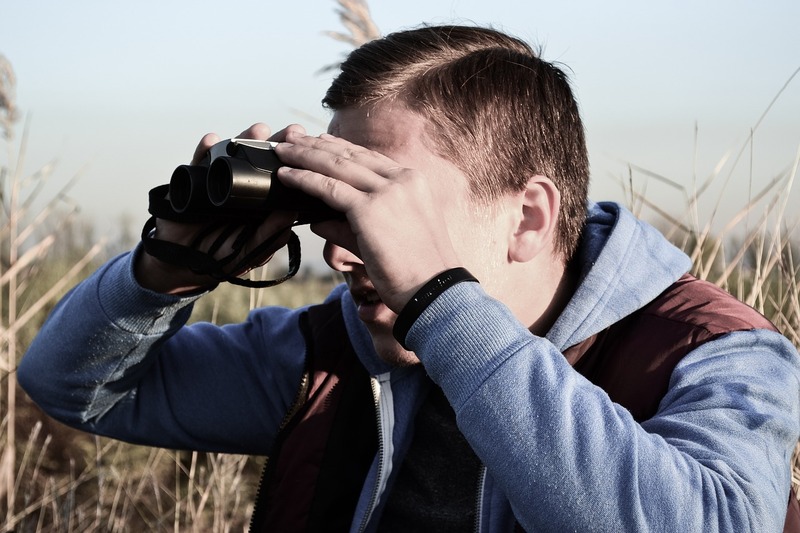 Spotting potential dangers will help you to avoid it immediately. Having a flashlight will give you a significant advantage. Another reason why you should carry a pocket flashlight is that unlike guns, you don’t need a permit to carry a flashlight. If you can’t bring a knife or a gun to help defend yourself, then at least bring a flashlight as it can also help you during emergencies. As mentioned above, you can blind your attacker with the help of the light. Lastly, flashlights are made to help light up the dark areas around you. You can use the flashlight when you’re looking for something under your bed or sofa. The flashlight can also be used when fixing your car at night. People who love to run or hike during the night can use a small pocket flashlight to light up the trail or the path that you’re running on. With all that being said, finding the right small pocket flashlight for yourself is essential. The above list will surely help narrow down your options since there are a lot of available flashlights in the market. Always remember that carrying a flashlight is essential and the flashlight on your Smartphone will never be enough to light up your path or to help you defend yourself against attackers. Start choosing the small pocket flashlights from the list above and enjoy its benefits.